This article is about the musical composition. For a singing group (sometimes called chorale), see choir. A chorale is a melody to which a hymn is sung by a congregation in a German Protestant Church service. The typical four-part setting of a chorale, in which the sopranos (and the congregation) sing the melody along with three lower voices, is known as a chorale harmonization. Starting in 1523, Martin Luther began translating worship texts into German from the Latin (Marshall and Leaver 2001). This created an immediate need for a large repertoire of new chorales. He composed some chorales himself, such as A Mighty Fortress. For other chorales he adapted Gregorian chant melodies used in Roman Catholic worship to fit new German texts, sometimes using the same melody more than once. For example, he fitted the melody of the hymn "Veni redemptor gentium" to three different texts, "Verleih uns Frieden gnädiglich", "Erhalt uns, Herr, bei deinem Wort", and "Nun komm, der Heiden Heiland" (Marshall and Leaver 2001). As early as 1524, Johann Walter published Eyn geystlich Gesangk Buchleyn, the first hymnal for choir, in Wittenberg. Johann Sebastian Bach harmonised hundreds of chorales, typically used at the end of his cantatas and concluding scenes in his Passions. In his St Matthew Passion, he set five stanzas of "O Haupt voll Blut und Wunden" in four different ways. He also used hymns as the base for his cycle of chorale cantatas and chorale preludes. 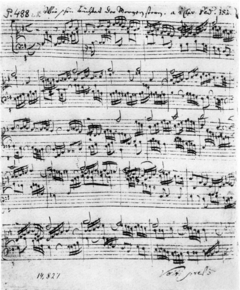 Bach concentrated on the chorales especially in the Chorale cantatas of his second annual cycle, composed mostly in 1724/25. 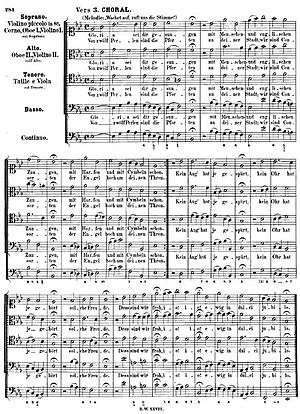 Today, many of the Lutheran chorales are familiar as hymns used in Protestant churches, sometimes sung in four-voice harmony. Chorales also appear in chorale preludes, pieces generally for organ designed to be played immediately before the congregational singing of the hymn. A chorale prelude includes the melody of the chorale, and adds contrapuntal lines. One of the first composers to write chorale preludes was Samuel Scheidt. Bach's many chorale preludes are the best-known examples of the form. Later composers of the chorale prelude include Johannes Brahms, such as Eleven Chorale Preludes, and Max Reger who composed Wie schön leucht' uns der Morgenstern on Nicolai's hymn, among many others. Anton Bruckner make frequent use of the chorale as a compositional device in Two Aequali (Harten 1996, 44–45), based on his understanding of musical settings of the liturgy and Johann Sebastian Bach's chorale preludes. He used chorales in his symphonies, masses and motets, for example Dir, Herr, dir will ich mich ergeben (van Zwol 2012, 701) and In jener letzten der Nächte (van Zwol 2012, 703), often in contrast to and combination with the fugue, as in Psalm 22 and in the Finale of Symphony No. 5 (Carragan n.d.). ↑ Tovey, Donald Francis (1911). "Chorale". In Chisholm, Hugh. Encyclopædia Britannica. 6 (11th ed.). Cambridge University Press. p. 269. Carragan, William. n.d. "Bruckner's Symphony No. 5: Timing Analysis". Marshall, Robert L., and Robin A. Leaver. 2001. "Chorale". The New Grove Dictionary of Music and Musicians, second edition, edited by Stanley Sadie and John Tyrrell. London: Macmillan Publishers. Harten, Uwe. 1996. Anton Bruckner. Ein Handbuch. Salburg: Residenz Verlag. ISBN 3-7017-1030-9.
van Zwol, Cornelis. 2012. Anton Bruckner 1824–1896: Leven en werken. Bussum: THOTH. ISBN 978-90-6868-590-9. Anon. 1980. "Chorale". The New Grove Dictionary of Music and Musicians, edited by Stanley Sadie. 20 vol. London: Macmillan Publishers Ltd. ISBN 1-56159-174-2. Randel, Don Michael (ed.). 1986. The New Harvard Dictionary of Music, third edition. Cambridge, Massachusetts: Harvard University Press. ISBN 0-674-61525-5. Randel, Don Michael (ed.). 2003. The Harvard Dictionary of Music, fourth edition. Cambridge: Belknap Press, for Harvard University Press. ISBN 978-0-674-011632. Look up chorale in Wiktionary, the free dictionary.